The Pet Wiki > Reptiles > Snakes > Do Snakes Blink? May 31, 2016 October 26, 2017 Comments Off on Do Snakes Blink? You can usually tell when a human or an animal is asleep by their closed eyelids. But snakes don’t have eyelids and can’t blink, making it very difficult to determine when they are asleep. 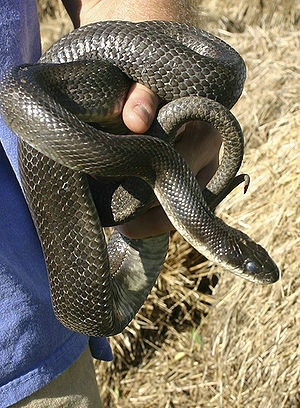 Most species of snakes are nocturnal and hunt at night. They sleep during the day for an average of 10 hours. Their pupils contract when asleep which is one way of telling if they are awake or not. A snake’s eyes have a covering of a single clear scale, a hard membrane called spectacles or brilles. The scale protects the eye from injury and also keeps it moist, preventing the eyes from drying out. 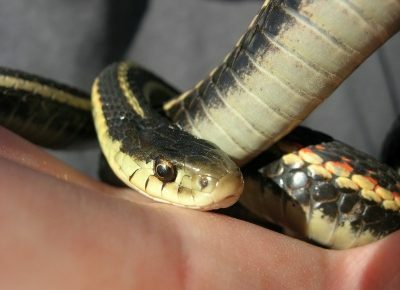 The eye scales are part of the snake’s skin. When the skin is shed, the eye scales are shed as well. Before shedding, the skin becomes dull and the eye scales become opaque due to a milky fluid secreted prior to shedding between the old and new skin. Snakes usually shed their skin in one piece and the eye scales are plainly visible on the shed skin. A snake’s eyesight is very poor. They track prey through movement and body heat. Snakes also don’t have noses. The tongue flicks in and out gathering particles from the air. 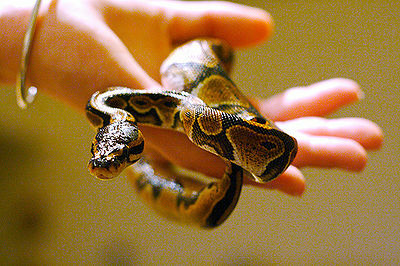 Specialized organs in the mouth enable the snake to transfer information about their environment. Please be cautious when coming upon a snake that you think may be sleeping. It will awake if disturbed.